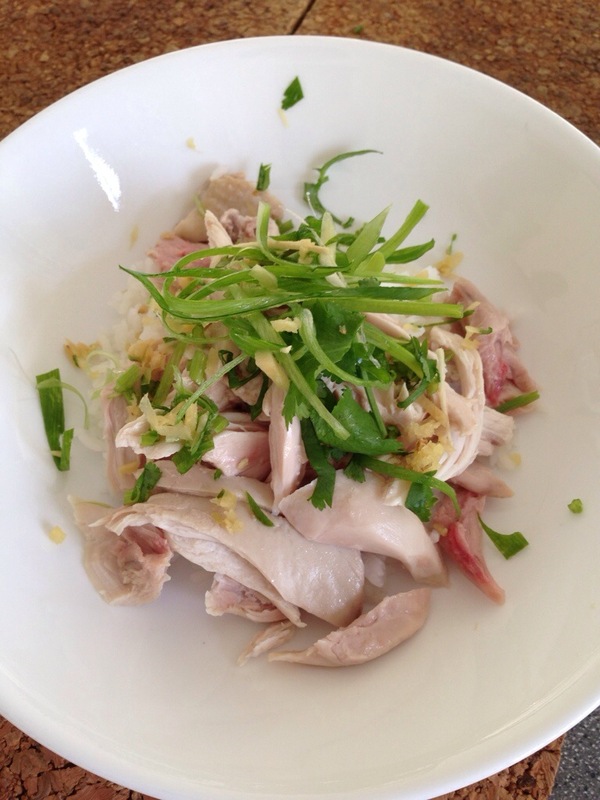 Hainanese Chicken Rice is a staple meal in my family. Mum cooks it at least once a week. 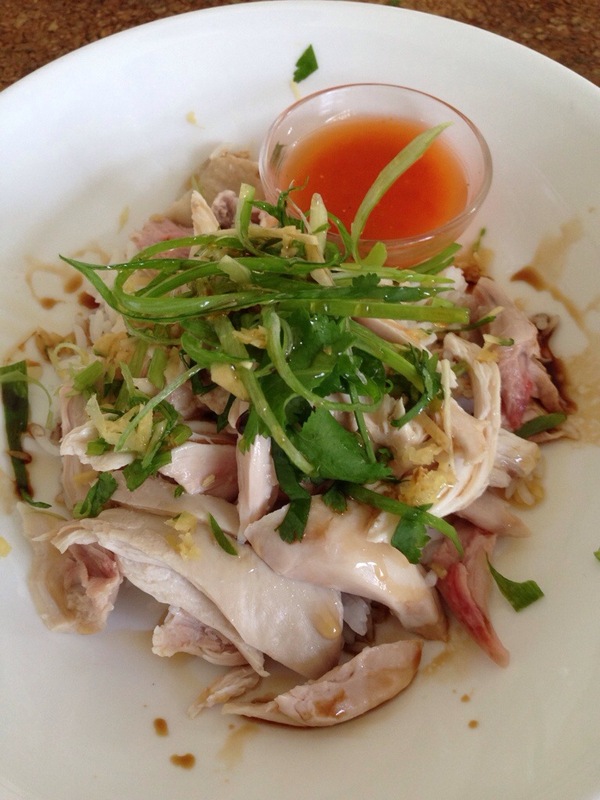 It is a dish found predominantly throughout South-East Asia, with each country / locality having it’s own unique variation, all centered around the same star ingredients – chicken & chicken rice. So what does one do with a lot of rice, boney chicken & condiments left over for the next day? 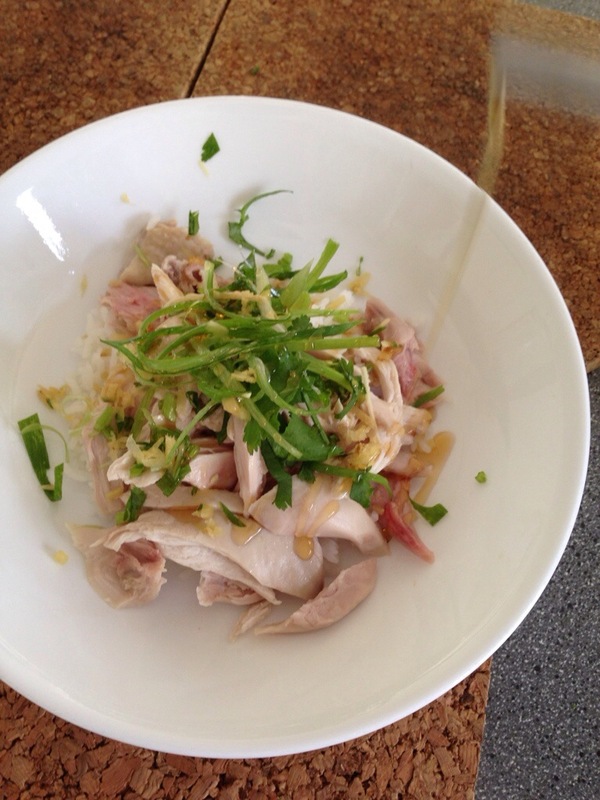 Well, I turn it into my very favorite Hainanese Chicken Rice Salad. I know it’s not original. I know most of the ingredients are exactly the same. But something has to be said about eating an all too familiar dish in a completely different way. You see, when I eat Hainanese Chicken Rice, if there is soup served, I take a sip of that first. It’s a very tense moment – I personally judge the rest of the dish based on how good the soup is. As shallow as this sounds, if the soup is good, the rest of the dish is usually good too – no matter how good (or bad) it really is. And vice versa. And if they don’t serve soup, that works too. Putting the funny aside – there’s a lot to be said about the pre-meal soup. You see – the soup stock is usually just the byproduct of steeping the chicken. If the soup doesn’t taste full bodied and you are served a cooked chicken, then one can assume that the chicken isn’t very fresh. On the other hand, if you are served a naturally sweet, full bodied soup, it is an indication that a deliciously fresh and sweet chicken possibly awaits. Of course, many places use MSG, but it’s fairly easy to tell if you have eaten this a thousand times – like me. Anyway, after taking a sip of the soup I proceed to scoop up some of the chilli & ginger sauce and pour it over some rice. I then cut a piece of chicken and some vegetable (if provided), place it on top of the soaked rice, scoop it up with a spoon and yes – you know what I do next. So enough with the visuals. 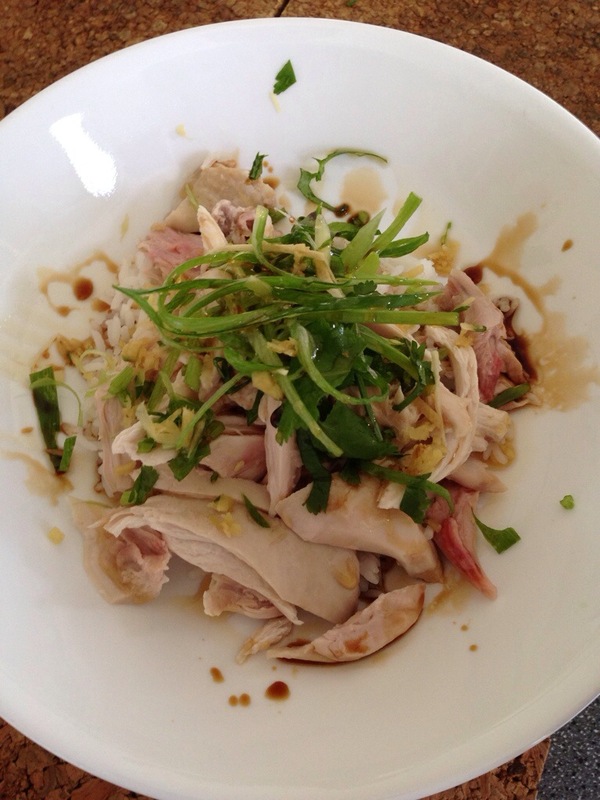 Why have I ramble on about my personal Hainanese Chicken Rice eating habits? Well it all formed part of my ‘enlightenment’ about how to eat this dish in a completely different way. The thing about this salad is that I can eat it exactly how I do but with minimal effort. All the same flavors and components on one spoon and in one mouthful. I also add some extra ingredients to liven up the flavor profile to make each mouthful a punchy delicious experience. The best part is that you don’t even need to use an actual traditionally cooked Hainanese Chicken – you can just use boiled chicken and it tastes exactly the same. **Firstly please note – in my opinion, quantity is irrelevant because you should be able to make however much or little as you please and to your taste. – Leftover rice, warmed in the microwave. 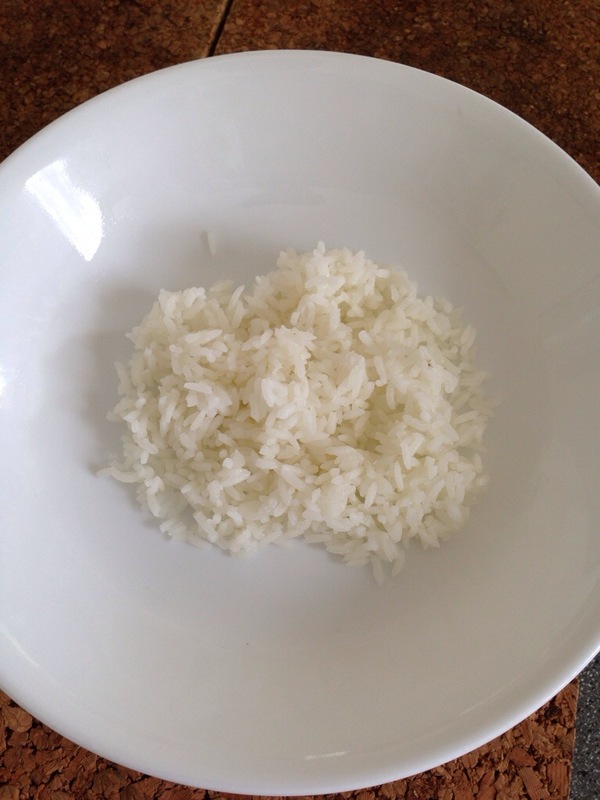 Use fresh rice if you have none left over. – Leftover boiled chicken, stripped off the bones into nice long, thin strips if you can be bothered. I couldn’t. The chicken is also used cold from the fridge. – Spring Onions, sliced on the diagonal, thinly. – Fresh Chilli or any leftover chilli sauce you may have. All you really need to do is assemble the dish in the order that the ingredients appear above. Follow my pictures below. I hope you enjoy this dish as much as I do! Oh – and the final picture is at the top. you get it at least once a week? I am so incredibly jealous!